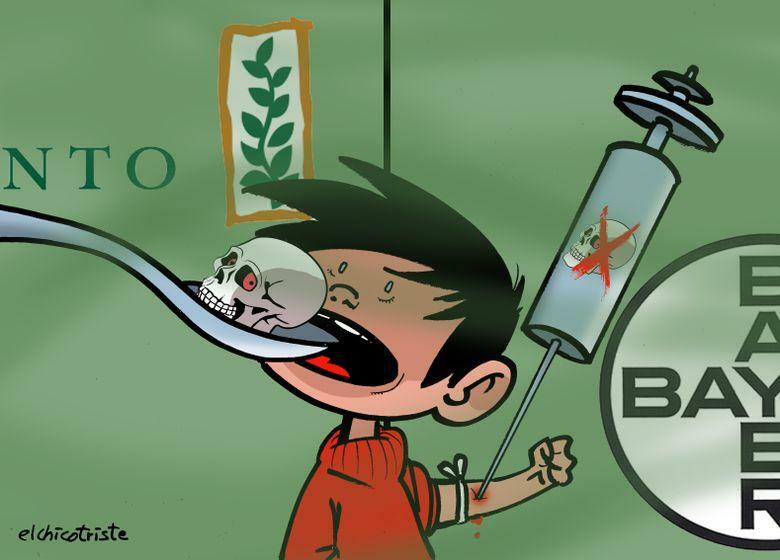 On what plane of reality is it possible that two of the world’s most morally bankrupt corporations, Bayer and Monsanto, can be permitted to join forces in what promises to be the next stage in the takeover of the world’s agricultural and medicinal supplies? Warning, plot spoiler: There is no Mr. Hyde side in this horror story of epic proportions; it’s all Dr. Jekyll. Like a script from a David Lynch creeper, Bayer AG of poison gas fame has finalized its $66 billion (£50bn) purchase of Monsanto, the agrochemical corporation that should be pleading the Fifth in the dock on Guantanamo Bay instead of enjoying what amounts to corporate asylum and immunity from crimes against humanity. Such are the special privileges that come from being an above-the-law transnational corporation. Unsurprisingly, the first thing Bayer did after taking on Monsanto, saddled as it is with the extra baggage of ethic improprieties, was to initiate a rebrand campaign. Like a Hollywood villain falling into a crucible of molten steel only to turn up later in some altered state, Monsanto has been subsumed under the Orwellian-sounding ‘Bayer Crop Science’ division, whose motto is: "Science for a better life." Yet Bayer itself provides little protective cover for Monsanto considering its own patchy history of corporate malfeasance. Far beyond its widely known business of peddling pain relief for headaches, the German-based company played a significant role in the introduction of poison gas on the battlefields of World War I. Despite a Hague Convention ban on the use of chemical weapons since 1907, Bayer CEO Carl Duisberg, who sat on a special commission set up by the German Ministry of War, knew a business opportunity when he saw one. Duisberg got his demonic wish. The opportunity to use the battlefield as a testing ground and soldiers as guinea pigs came in the spring of 1915 as Bayer supplied some 700 tons of chemical weapons to the war front. On April 22, 1915, it has been estimated that around 170 tons of chlorine gas were used for the first time on a battlefield in Ypres, Belgium against French troops. Up to 1,000 soldiers perished in the attack, and many more thousands injured. In total, an estimated 60,000 people died as a result of the chemical warfare started by Germany in the First World War and supplied by the Leverkusen-based company. Papantonio, citing Bayer’s 2014 annual report, said the company is facing 32 different liability lawsuits around the world. For the 2018 Bayer liability report, click here. Before flushing your Bayer products down the toilet, you may want to put aside an aspirin or two because the story gets worse. One of the direct consequences of the ‘Baysanto’ monster will be a major hike in prices for farmers, already suffering a direct hit to their livelihood from unsustainable prices. Yet it’s hard to imagine the situation getting any worse for the American farmer, who is now facing the highest suicide rate of any profession in the country. The suicide rate for Americans engaged in the field of farming, fishing and forestry is 84.5 per 100,000 people - more than five times that of the broader population. This tragic trend echoes that of India, where about a decade ago millions of Indian farmers began switching from farming with traditional farming techniques to using Monsanto’s genetically modified seeds instead. In the past, following a millennia-old tradition, farmers saved seeds from one harvest and replanted them the following year. Those days of wisely following the rhythms and patterns of the natural world are almost over. Today, Monsanto GMO seeds are bred to contain 'terminator technology', with the resulting crops ‘programmed’ not to produce seeds of their own. In other words, the seed company is literally playing God with nature and our lives. Thus, hundreds of thousands of Indian farmers are forced to buy a new batch of seeds – together with Monsanto pesticide Round Up - each year and at a very prohibitive cost. But should the world have expected anything different from the very same company that was involved in the production of Agent Orange for military use during the Vietnam War (1961-1971)? More than 4.8 million Vietnamese suffered adverse effects from the defoliant, which was sprayed over vast tracts of agricultural land during the war, destroying the fertility of the land and Vietnam’s food supply. About 400,000 Vietnamese died as a result of the US military’s use of Agent Orange, while millions more suffered from hunger, crippling disabilities and birth defects. This is the company that we have allowed, together with Bayer, to control about one-quarter of the world’s food supply. This begs the question: Who is more nuts? Bayer and Monsanto, or We the People? It’s important to mention that the Bayer – Monsanto convergence is not occurring in a corporate vacuum. 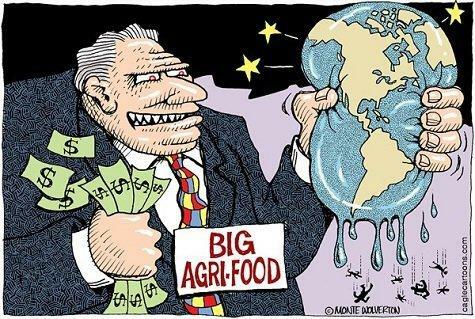 It is all part of a race on the part of the global agrochemical companies to stake off the world’s food supplies. ChemChina has bought out Switzerland’s Syngenta for $43 billion, for example, while Dow and DuPont have forged their own $130 billion empire. However, none of those companies carry the same bloodstained reputations as Bayer and Monsanto, a match made in hell that threatens all life on earth.